Martin yesterday told me about Everytrail an application/website for tracking and sharing your bike rides (and other GPS-tracked activity...hiking, motorcycling, skiing, etc.) I came home yesterday with the idea of riding out to Paint Branch Golf Complex, but the reality was much less exciting. I therefore present to you my first Everytrail ride: Flat Tire Ride. My riding yesterday was divided into two parts. In the early afternoon, I headed to the bike shop for some supplies, including a bell and a rear light. I had a horn, but riding up behind people and honking the horn tending to be overkill. I also needed a rear light that wouldn't pop off the bike (usually at the wrong moment -- crossing the street, headed through a mud puddle). Afterward, I went down to the Anacostia. As you can see, I got confused at first and headed towards the Northeast Branch Trail before doubling back to the Northwest Branch Trail. I was looking for the Sligo Creek Trail, which heads towards Takoma Park and Silver Spring. I passed the West Hyattsville metro station (where the trail system will eventually connect into DC) and made it to Sligo Creek in time to look across the bridge, turn around and head back. In the evening, I installed the bell and the rear light. I didn't need the bell, but it had gotten dark enough to need the light. 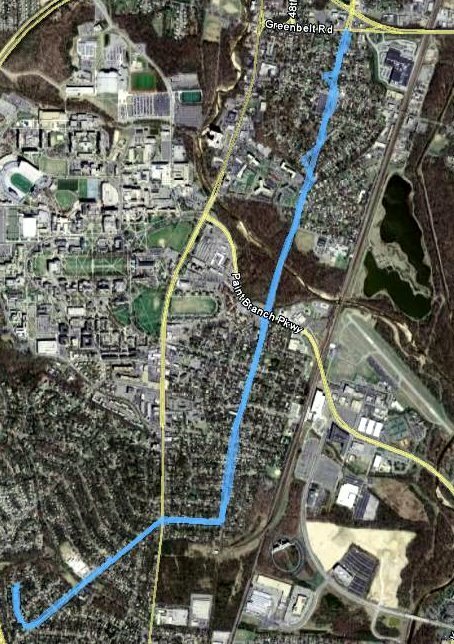 I went up the College Park Trolley Trail to the Paint Branch Trail, but when I got to campus, I cut back through the university. It was nice riding past the chapel where Christina and I got married. I don't usually like riding along the sidewalk, but it was too dark to turn back onto the trail, and biking Route 1 is a suicide mission. So I hugged the sidewalk through downtown College Park, then cut through University Park to get home as the light was fading. Since we've had continued storms, I decided to avoid paths that seemed like they had danger of mud. That led me to the College Park Trolley Trail. 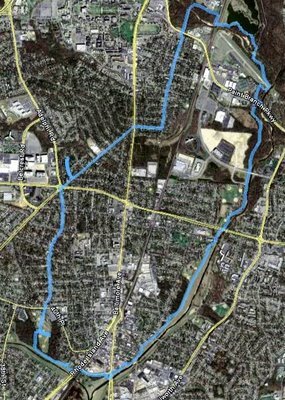 I started out on my usual path and was happy when I crossed Paint Branch Road and got to the less-crowded part of the trail. Since the maps I've been posting are probably not too interesting to those who don't live around here, I broke out my camera mount to take a few pictures. Good timing, too, because right after that, a deer crossed the trail. On Thursday, I turned right towards the University, but today I headed north along Rhode Island Avenue. I was pleasantly surprised that the trail only followed the road for a few blocks before becoming a separate trail again. After 24 minutes of riding (my GPS tracks moving time and stopped time separately), I made it to Greenbelt Road, a busy thoroughfare that I'd have to walk my bike across. Unfortunately, at this point, the skies opened up, so I decided to head back. Because the rain was, at times, heavy, I tried to see how fast I could make the return trip. 22-and-a-half minutes. Longer, really, since I slipped my chain and spent several minutes getting it fixed with the help of friendly passers-by -- I'll have to do bike maintenance and cleaning on a sunnier day (hopefully tomorrow). Anyway, as always, I was happy to make progress on a new route. Given more time and less rain, it should be pretty easy to make it up to the businesses north on Rhode Island Avenue. Today after work, the storms subsided enough for me to get in some bike riding. Since the trails around Lake Artemesia can get quite muddy after rain, I decided to look for another path. So I took the College Park Trolley Trail, but instead of turning right to go to Lake Artemesia, I made a left on the Paint Branch Trail. The trail meets Route 1 near the University -- on the way out, I didn't find the tunnel, so I walked my bike across. It then continues on through the University to the Paint Branch Golf Complex. I turned around right before there (since I wanted to keep my round trip under an hour). It's tempting to see if I can strap a golf club to my bike (note to self: I'll need a golf club for that) and ride up to the driving range. This was an out-and-back route, which I find less interesting than the loops. As for avoiding the mud, that didn't work so well. There were three places on the Paint Branch Trail where I had to leave the trail to avoid puddles. So I need to wash my bike this weekend. 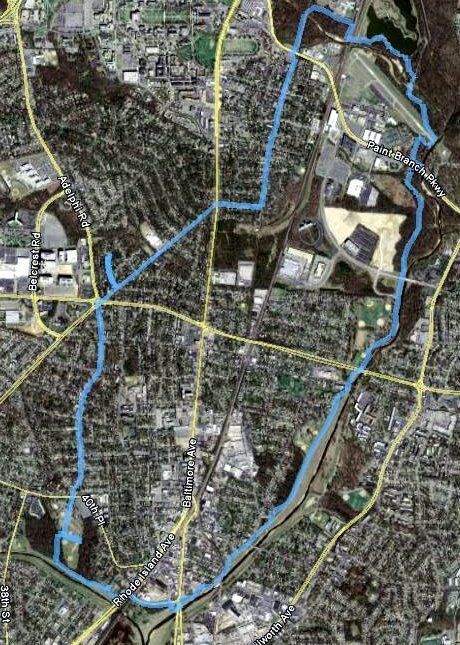 I think next time I may stick to the Trolley Trail, which is mostly on-road. Well, 8.7 miles, according to my GPS receiver, but next time I won't take the detour in Magruder Park looking for the trail connection. This is a variant of an unplanned trip I took a couple of weeks ago which started out with a trip to the bike shop. 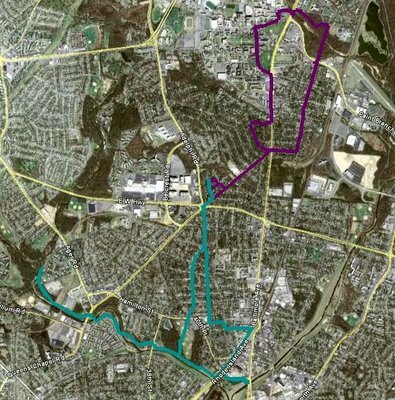 This time, instead of taking the usual route through Hyattsville via 41st to hook up with Route 1, I took 40th, which ends at Magruder Park, and then connects up to the Northwest Branch Trail. I took that south to where the two branches of the Anacostia meet, then picked up the Northeast Branch Trail. After a couple of miles, I'm back in Riverdale, and this connects up with some of my usual riding -- around the airport, then past Lake Artemesia. 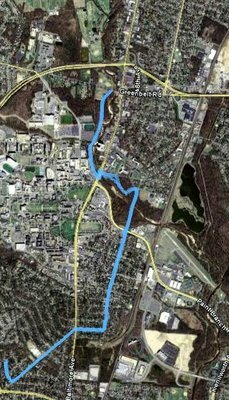 Eventually, I hook up with the College Park Trolley Trail, then cut over to University Park for the trip home. It took me about an hour and fifteen minutes, so it's a good ride for the weekend when I have more time. If I wanted to extend it, I could go the long way around Lake Artemesia. I could also head up the Northwest Branch Trail to see where that went. There's also a short segment heading south. I'm also glad that I'm getting in good enough shape that this doesn't feel like a ridiculous ride. When I went out to my car today to head to the farmers market, I was surprised to see my path blocked by part of a large tree branch. I was even ore surprised to see how close the branch came to taking out my car...some of the twigs were poking into my wheel. Sometimes I feel like I lead a charmed life; a few inches in the wrong direction, and I would be missing a side-view mirror. I was just reading Dr. Gridlock's chat on washingtonpost.com when I noticed that someone wrote in linking to a gallery of pictures from Sunday's ride, along with my YouTube video. The above is from the gallery, of course. Yesterday was the first day the Woodrow Wilson Bridge was open to bike and pedestrian traffic. Despite the cold I'm recovering from, I decided I wanted to be part of this history. So I met up with a bunch of other bicyclists on the Maryland side. (For those of you from out of town, the Wilson Bridge is the part of the Beltway that goes across the Potomac at a relatively wide point.) Going with a group definitely gave me the confidence to do this, but now that I know the way, I realize that the only difficult part is going uphill to reach the bridge. (Contributing factors may have been my cold, and the fact that I was nervous about shifting the front gear to first based on some recent problems.) I shot the video below from my handlebars. The organized ride included 4 more miles around Alexandria (or a longer trek to Mount Vernon). Once I realized, though, that I could just turn around and go home, I opted to turn back. Anyway, it's a neat new place to ride...you can look off the bridge at the Capitol and Washington Monument, for example. Hopefully in coming years, Maryland will connect it to more of its trail network. My latest toy is a camera mount for my bike. I thought it would be fun to shoot video from the perspective of a bike rider. Below you can see my first attempt. To spare you the ambient noise of biking (hint: "whoosh"), I have replaced the soundtrack with some classical music. Unfortunately, I can't do anything about any motion sickness you may experience watching the video. Stay tuned for a much more exciting ride that I'm in the middle of uploading now. I took a couple of golf lessons this week. Christina was set to join me, but came down with a nasty bug on Sunday; hopefully she'll be back on her feet soon. One of my reasons for not taking golf lessons before is that I don't need another expensive, time-consuming hobby. Another reason is that, although I like the idea of continuing education, I am rarely home for long enough to take a class. With the exception of Memorial Day weekend, I've been home for an extraordinarily long period of time, by my standards. So it seemed to be a good time to fit in a golf class, offered through the Prince George's County parks department. The first class was fun, partially because half of it consisted of whacking the ball without great concern for accuracy. At the end, though, I had one question for the instructor. 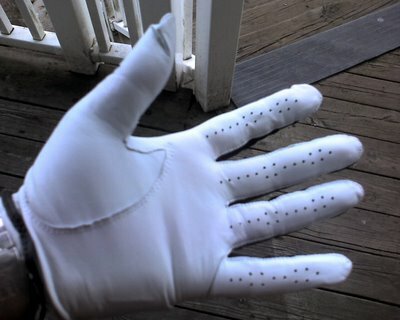 "What am I doing wrong if skin is coming off my hand when I hit the ball?" "Nothing," replied the golf pro. "You'll develop calluses. Or you could get a glove." A $10 glove seemed a reasonable precaution to prevent further erosion of my epidermis...well, it ended up mitigating it, at least.